The emergence of MansionBet in 2018 sees fresh blood infused into the betting industry to serve bettors the more. Having received license from the UK Gambling Commission (UKGC) and with a team of experienced workers MansionBet has been living up to expectations within one year of operation. Joining MansionBet, you will enjoy smooth interface with classical selections at reasonable odds. MansionBet is a new betting site where you can light up your betting experience. MansionBet has not gained much in term of reputation because the site just went live in February 2018. With the level of its operation, most bettors are still new to the site and they are adapting fast to the site system. But there few remarkable attributes that make MansionBet a promising site to play. Being part of Mansion Group accredited by UK Gambling Commission (UKGC) in 2007, since then they offer Casino and poker at a top level and now include sport betting. Another challenge associated with complaint handling had been dealt with as the company makes efforts daily in making the system more transparent. Also, on MansionBet’s website, you have control over your session because you are availed with reminder pop-up that notifies you at intervals the time you have spent surfing the site but at your own discretion. In all, users’ security is guaranteed at MansionBet. MansionBet wants you to be conscious of your deposit, therefore provides room for users to set their weekly deposit limit between £10 and £25,000 provided they are interested. The only challenge we have with deposit and withdrawal is that only credit and debit card can be used for transaction. This problem cannot be overlooked as there are many eWallets that easily help out during transaction. Maximum withdrawal on MansionBet’s site is £100,000 in a day and processing takes less than 48 hours. Currently, MansionBet does not have dedicated apps for your mobile devices. Therefore one needs to engage the use of mobile or computer browsers in other to surf the site; checking odds, placing bets and deposit/withdrawal transaction. But Mansion Casino is available as an Android and IOS app and the app has been great so far. With this, we suggest that very soon apps for MansionBet will be available. 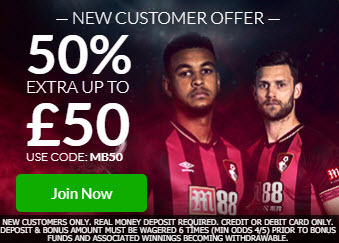 MansionBet offers 50% of deposits up to £50; bonus which is available for bet instantly. To get this offer, the code to use is MB50. In contrast to the bonus given by other bookmakers, MansionBet offer will only be available for withdrawal after a 6X wager with a minimum of 1.8 odds each time. Unlike most bookies that make your bonus available for withdrawal after a single bet, much work has to be done before one can successfully withdraw MansionBet’s bonus. The bonus also expires if not used after 30 days of deposit. The benefit associated with this bonus is; punters will be able to bet with bonus without touching their actual deposit meaning that one can finally earn up to 5 times of bonus offered by other bookies. MansionBet partnership with SBTech one of the best odd software provider companies which provide 20,000+ live bets per month and 2,000+ markets daily ensure availability of wide range of betting markets to satisfy users betting urges. One notable fact is that MansioBet doesn’t guarantee the bet like established bookies such as William Hill or Bet265 that guarantee you have the best odd in horse and greyhound race. Sadly, MansionBet wouldn’t promise you this. SBTech’s software help Mansion’s crew to effectively monitor odds of daily markets (live and pre-match) and adjust odds in real-time. Collaboration with SBTech ensures availability of markets on 20,000+ live events across various competitions every month. Basically, live odds are available in the following events; Football, Basketball, Volleyball, Ice Hockey, Table Tennis, Cricket, Handball and Futsal. Availability of numerous live events shows that MansionBet is investing heavily on its betting services. Despite the numerous live betting markets, MansionBet doesn’t offer users live streaming. MansionBet’s support is available every day throughout the week between 9.00am and 1.00am GMT for live chats. Mansion team can be reached via Twitter and Facebook. Emails and phone calls are other ways to get in touch with MansionBet’s support.